When I first started at Distilled in June 2011, I was intrigued to learn from the Sales team on what worked, what was effective, and how to apply it to my consulting in order to boost client relationships, maintain momentum on projects, and always be forward thinking. Currently, Distilled integrates SEO with Consulting and Account Management and consequently, we have our work cut out for us when setting and maintaining projects for success. Having worked at other agencies in the past, I understood the importance of building a solid relationship with a client from the first touch point (which in my experience is sales) all the way through to signing and kicking off the project. I also quickly figured out how vital it is to make sure we sell them the right project and manage their expectations from the get go. It is so much easier to set expectations right the first time than it is to go back to the drawing board 4 months later to try and correct it. These were just a reasons why I felt compelled to integrate myself into the Sales process as much as possible. 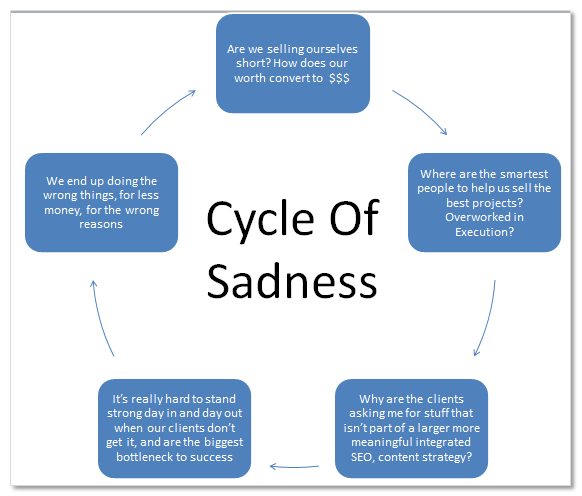 Below are some ways that the integration of SEOs with Sales has improved Distilled's ability to win the type of projects/clients that we want, while also preventing the "Cycle of Sadness" that many SEOs feel a part of. Currently, the Sales team is the first point of contact for any lead that Distilled receives. In general, they'll first contact the prospect and decide whether this project would be a good fit by looking at a variety of factors, such as project scope, project goals, client expectations, project budget, as well as the client's business. If the prospective client has goals and expectations aligned with Distilled's, we would deem the prospect a very good match and integrate SEO consultants into the process. By the time an SEO consultant is brought into the Sales process, we've already identified the prospect as being a project we want to close. As a result, a SEO consultant is brought in to analyze the prospective's client site and identify opportunities (both short-term and long-term) as elements that we should focus on during our engagement together. Distilled has put together a universal questionnaire created by Paddy Moogan that would be answered by the consultant as they peruse the site. If you were the in-house SEO on this project, what are the first 3 things you would do? This helps Sales understand the overarching possibilities of any project, regardless if the client has specifically identified for us what he/she wants us to do. As a company, we don't want to limit the type of projects we have based just on what our client's want, but what they need. As a result, we are also able to position ourselves more as building a partnership with our clients and less as SEO vendors. Can you give me 3-5 quick wins for the client? This isn't always possible, but if it is we should absolutely pre-deliver this information to the client. Examples could include non-crawlable converting pages, homepage issues, and accidentally blocking important pages . What are the major risks for this project? This question ultimately helps the Sales team properly set expectations. What are the major opportunities? What would a game changer look like for this client? We want to ensure that we do understand the specific needs of a prospective client. Sometimes, a game changer won't be SEO, but instead could be paid search, CRO, content, PR, or a combination thereof. 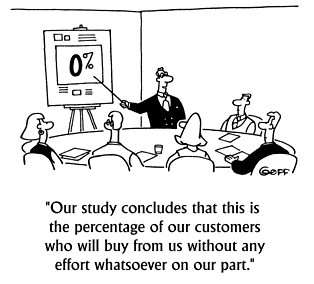 Helping the Sales team identify that for us will result in a win-win for everyone involved. What do you think is the main goal for this strategy? Once we identified an opportunity, we want our clients to understand why they should care about the opportunity. Is it aligned with the client's goals and if not, are there opportunities to work with the client on making sure this will become a goal? Do you recommend the client need internal SEO training? I often answer this question in collaboration with the Sales team, as I've not had the opportunity to speak to the prospect directly at this point. If they deem that the prospect has very limited SEO knowledge, often times we find it's worth the investment to provide these clients with basic SEO training. This serves two purposes: an understanding of how detailed we need to make our recommendations (example: if we recommend the client 301 redirect specific pages, will they understand the rationale behind this recommendation? If not, we want to make sure the explanation is included alongside the recommendations), as well as educating the client on SEO best practices to make sure they're learning (and the client's company is learning) throughout the engagement. We want to avoid producing redundant work as much as necessary to ensure we make best use of the client's budget and everyone's resources, both agency side and client side. The goal is for Distilled to integrate ourselves into the existing company rather than reinvent the wheel. The purpose is to properly set the client's expectations on realistic timelines for the engagement. What are your personal targets for this project/KPIs you'd like to set up for the project? This forces the consultants to understand the client's site in more depth. Although there are always standard metrics/goals that consultant's track, such as organic search traffic, etc... if we can provide the prospective client with even more detail, that provides us with a unique value proposition for any client that we really want to work with. It also goes along with the goal of ensuring all of our recommendations are customized to the specific needs of any one client. What will the client need to do for the project to be a success? This helps set proper expectations on the client side. From experience, we know that in certain types of companies we often run into very similar challenges, like lack of integration between different departments, long sign-off processes that are beyond our control, etc... Opening up the communication channels now often provides a full picture for our client of how long a project will realistically take, as well as making sure we have some ideas on how we will deal with these challenges once a project is officially signed off. Where do you think the site could be in 3 month's time? 6 month's time? This will help paint a complete picture for the client of realistically how long some aspects of this project will take and how long it may take to see results. Doing so early on helps to avoid major friction points later on and get all parties involved on the same page before a project starts. Working with Sales has been instrumental both in signing clients we want to work with, as well as retaining and upselling the clients we want to keep. This allows both SEOs and Sales to spend considerable time/effort on their strengths. For an SEO, it's about defining the strategy and gaining a deeper understanding of a prospective client's niche market. For Sales, it's about spending resources researching the prospective client's company, understanding the role of the point of contact at that company, and ensuring that when we actually speak to the client, we can speak directly to the client's needs. I've personally learned to use Sales to help build my knowledge of a prospective client's company, such as is my point of contact using a consultant to build their company's knowledge base, to convince higher-level executives of internal changes that need to be made, or to bypass internal red tape? By gathering a complete picture of the client's needs, you can be much more resourceful with your time and get straight to the point. This also builds trust/a partnership between you and the client, resulting in more opportunities to work on bigger projects and longer engagements with the projects you care about. Any changes in the internal structure of the organization? I've personally found the integration of SEOs working together with Sales fulfilling. Not only do I have another internal support system, but I'm also able to work on projects that bring the most value for my clients, continue to work with clients I enjoy, and help bring in more exciting projects to the Distilled pipeline.